Gene Expression: Is virtual reality making a comeback? 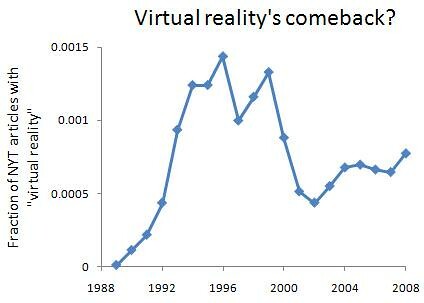 Is virtual reality making a comeback? In the Angry Nintendo Nerd's video about the Virtual Boy -- a short-lived video game console that claimed to offer a "virtual reality" experience -- he says that back in the mid-1990s, it seemed like the coolest thing, but that now no one cares about virtual reality. This, he claims, is why even with better technology than before, no one is making virtual reality systems for the average consumer anymore. Certainly that seems true for pop culture: the Virtual Boy, the movies The Lawnmoer Man and The Matrix, Aerosmith's video for "Amazing," and a whole bunch of video games with "virtual" in the title came out then, vs. nothing like that now. But when I went to check the NYT, I found a little surprise. Sure enough, there was a flaring up and dying down of the phrase that jibes with what we'd expect -- but there's been a modest yet steady increase in the phrase's usage since 2003. I skimmed the titles of the articles and didn't notice any clear pattern; maybe they're simply using it more in military training, and the news items are about that. Whatever it is, there's something to be explained. Not knowing anything about virtual reality, I'll leave it up to others to hazard a better guess. The graph of its appearance in the NYT is below the fold.